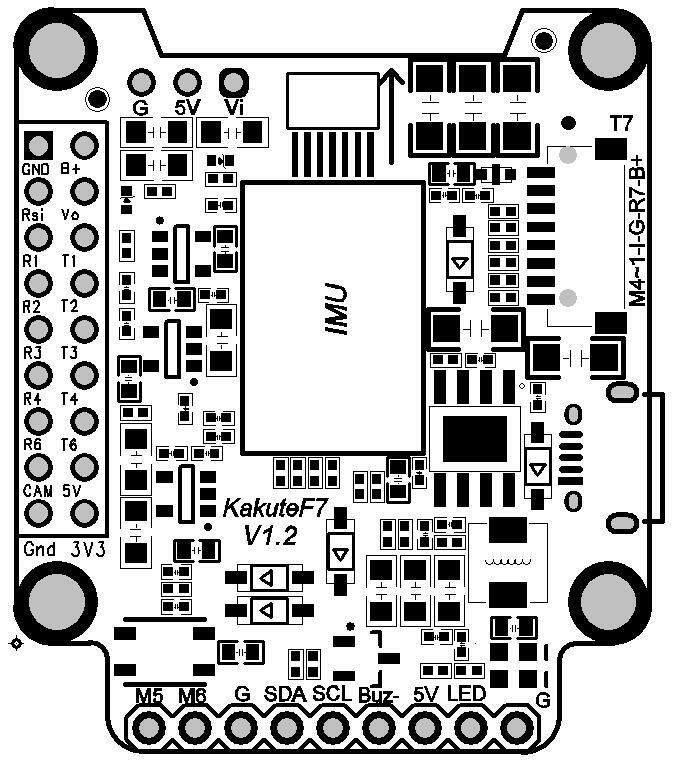 The KakuteF7 comes in two varients with the primary difference being the AIO (All-In-One) board employs current sensor and provides power distribution in each of the four corners. Both variants include a 5-volt regulator rated for 2 amps, OSD, vibration-isolated IMU, etc. The UARTs are marked Rn and Tn in the above pinouts. The Rn pin is the receive pin for UARTn. The Tn pin is the transmit pin for UARTn. 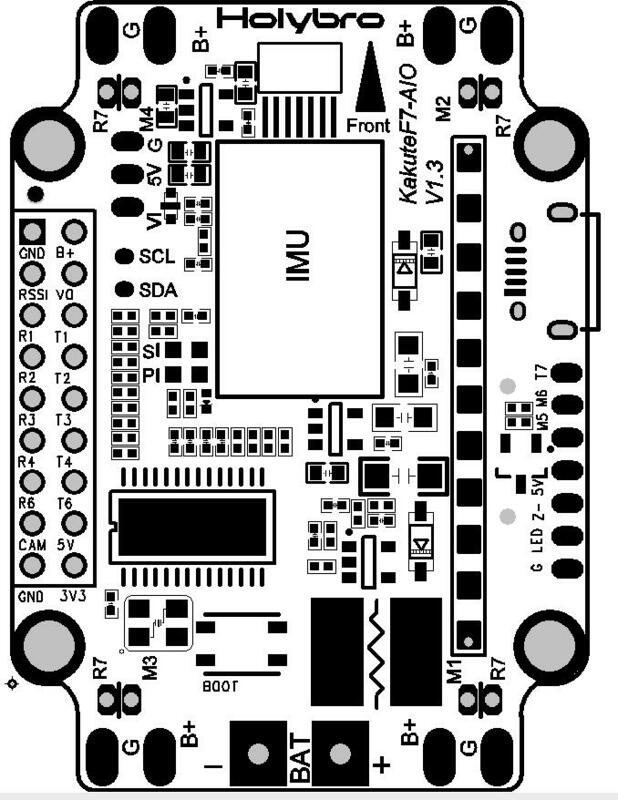 The SERIAL5 port (UART7) is for ESC telemetry, and has a R7 pad on each of the four corners of the KakuteF7 AIO board. RC input is configured on the R6 (UART6_RX) pin. It supports all RC protocols. The KakuteF7 AIO supports OSD using OSD_TYPE 1 (MAX7456 driver). The KakuteF7 supports up to 6 PWM outputs. The pads for motor output M1 to M6 on the above diagram are for the 6 outputs. All 6 outputs support DShot as well as all PWM types. Channels within the same group need to use the same output rate. If any channel in a group uses DShot then all channels in the group need to use DShot. The AIO board has a built-in current sensor. The current sensor can read up to 130 Amps. The voltage sensor can handle up to 6S LiPo batteries. 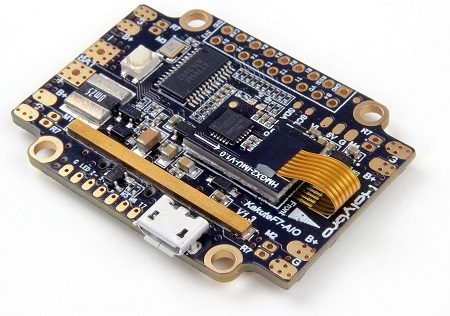 The Kakute F7 and Kakute F7 AIO do not have a built-in compass, however you can attach an external compass using I2C on the SDA and SCL pads. Initial firmware load can be done with DFU by plugging in USB with the bootloader button pressed. Then you should load the “with_bl.hex” firmware, using your favourite DFU loading tool. Once the initial firmware is loaded you can update the firmware using any ArduPilot ground station software. Updates should be done with the *.apj firmware files.